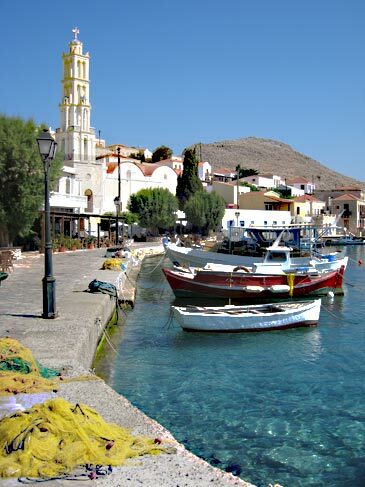 Just a hop by bus from Rhodes to Kamiros* (or our agents can arrange a transfer) and a skip by caique from there bring you to Halki, a rugged, rocky island with a gentle, picturesque harbour and village on the sheltered south coast. 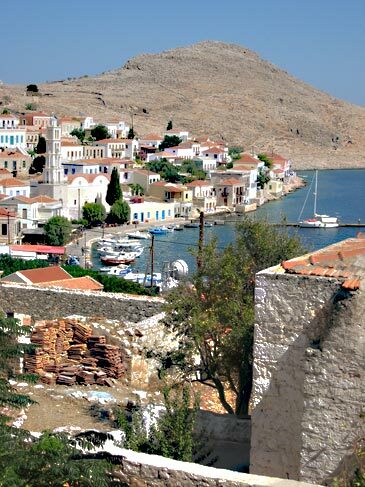 There is no other habitation, although there once was at the old chora, perched on a hill top and now the magnet for many a pre-dinner nearly vertical stroll. 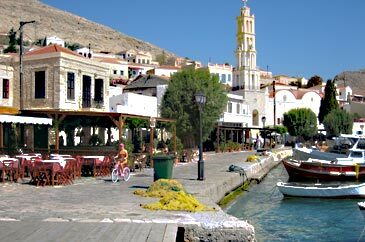 Other than that, activity is restricted to enjoying the nice sandy town beach and taverna, the evening life outside, lots more tavernas on the waterfront and the occasional caique trip to a deserted nearby island or just an inaccessible cove on Halki itself. 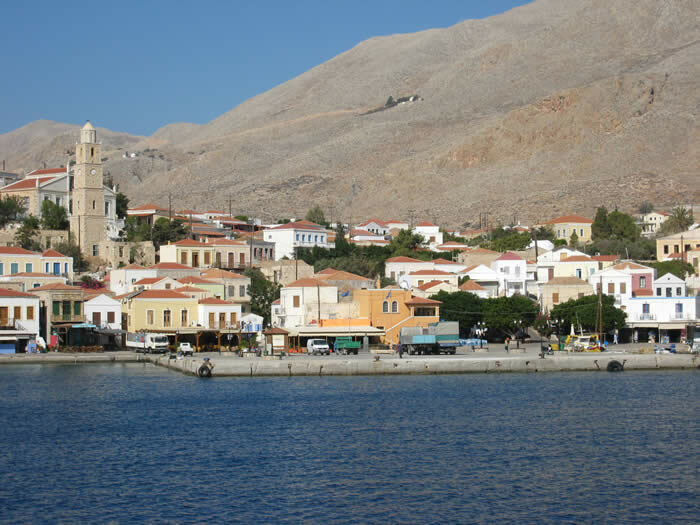 *Ask us about staying over at the Althemenis - one of two excellent fish tavernas at Kamiros Skala - if you feel like a more lesisurely transfer to Halki. We may have been able to find a contact for them by then. 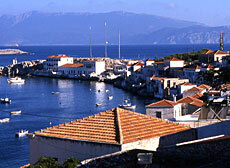 We have featured this hotel under a few different names over the years and followed its chequered history from afar. The hotel reopened as Aretanassa Hotel in 2017. Yiannis and the new team are widely appreciated - we have heard Nikos the chef described as a culinary genius! Other adjectives bandied around included spotless and exemplary. We really must get back there ourselves. 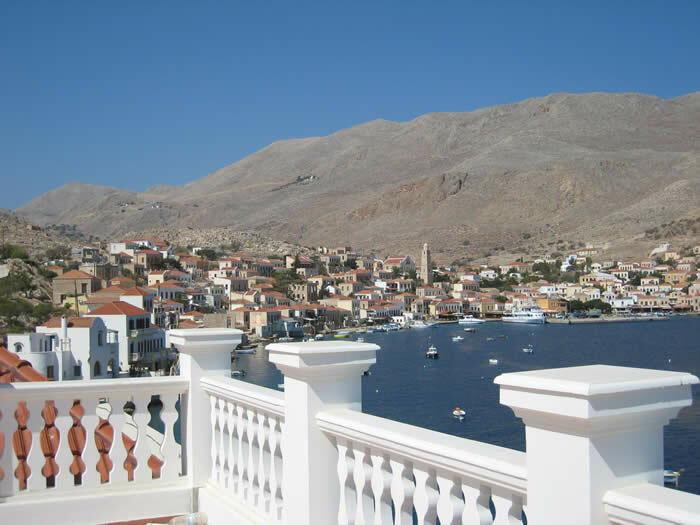 The hotel graces the southern tip of the harbour which forms a natural terrace with a stunning view across to the string of tavernas on the quayside. Handy for all the water-front life, but just out of earshot. Cat 3+* All rooms balcony with sea view. Free wifi in public areas.